Recounting the details of a travesty that took place more than 20 years ago is a valuable and important history lesson, but at times tedious. Documentarian extraordinaire Ken Burns teams up with his daughter and her husband on this documentary about the 1989 Jogger Case involving a raped and beaten woman and five wrongfully convicted youths. The first 30 minutes could stand up on its own as a found footage journey of New York City in the 80’s. Chock full of mesmerizing images from that part of the world at that time in history is expected from a Ken Burns doc, but the meandering and lack of focus and style in the second half leave you wondering who directed what. What could have been told in 90 minutes took 130 and the film suffers as a result. Might have been better served as a segment or two on 60 Minutes. And why now? This modern day court style lynching is horrific and beyond upsetting and the interviews with the five wrongfully imprisoned men now, boys then is harrowing and heartbreaking, but why now? They’ve been released for nearly 10 years and their countersuits are all stagnant. 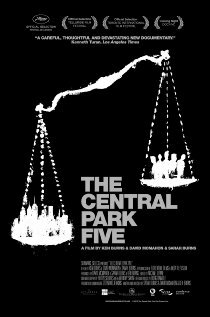 Similar to the much more recent West Memphis Three, the Central Park Five seems more like a valuable, but somewhat distant history lesson. Posted on Thursday, December 13th, 2012 at 12:02 pm and is filed under Reviews.